I wanted to post a Coppersmith Barbet this month but it still has a few hours of colouring left so it will be next month’s bird. There is a large photograph of a colourful Coppersmith Barbet in the Audubon book ‘Bird – The Definitive Visual Guide’, which I thought would be a good challenge for my newly acquired 60 Polychromos colour pencils. The pencil set sat unused for a month and a half, intimidating me with its plethora of shades and freshly sawed wood smell. Today I started colouring the Barbet (which I sketched in graphite pencil last week) and boy was it fun to play with so many shades! But I didn’t want to rush, so back in time I went to find a bird (well two) for February the 8th. 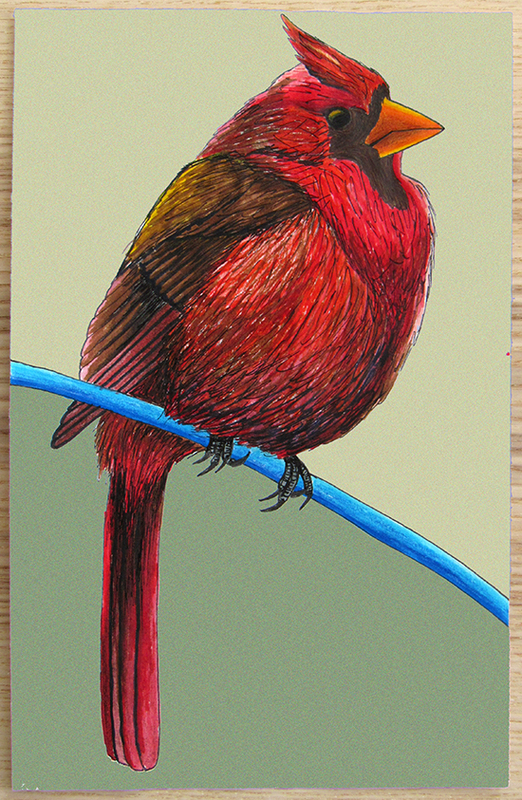 The Northern Cardinal is a copy of a sketch on the cover of The Laws Guide to Drawing Birds. I gave myself a one hour time limit and actually stuck to it! I used a graphite pencil, a Faber-Castell Pitt pen, Crayola markers and Staedtler colour pencils. The background is Photoshopped. Oh, the martian eyeball! For some reason, The Atlas of Breeding Birds of Alberta has a photo of a Yellow-headed Blackbird with a few reddish and brownish streaks on its head. And I overemphasized them. And J suggested a martian eyeball. Which doesn’t come up when Googled. If you are curious, you need a small flashlight and a testicle. 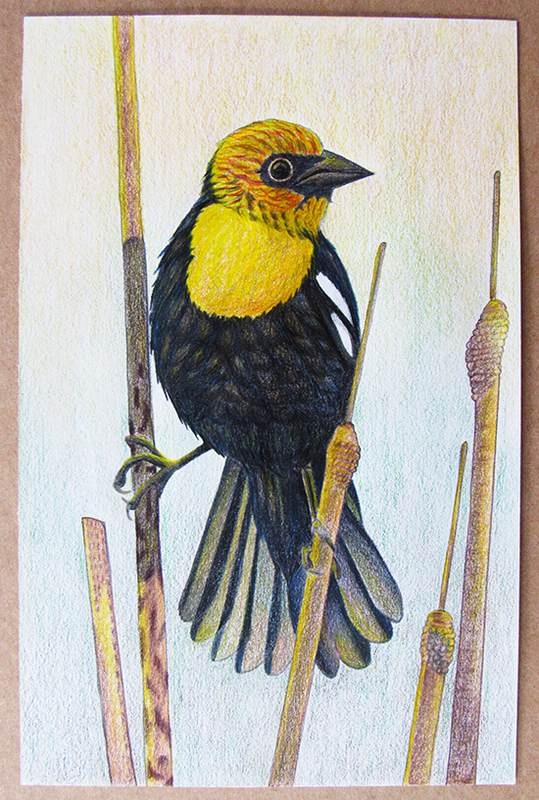 The Yellow-headed Blackbird was the last bird I drew with my 12 Staedtler colour pencils. Kerfe and Nina at Method Two Madness are the affable hostesses of Draw a Bird Day. Here is their roundup of last month’s participants. Oh my, these are stunning Myriam! The Cardinal is my favorite though. The fine details are amazing. I don’t think.keep I have the patience to do this. Thanks Deborah :-)! The cool think about painting/drawing is you can pick the level of detail you want to use. I tend to gravitate toward detail but I’d like to work on less detailed drawings too (they look simpler but in many ways they aren’t). So, I have to tell you. I purchased the Laws book on drawing birds over a year ago, but lost it! I couldn’t find it anywhere, then I packed up most my books when we did the remodel and I hoped it would turn up. It didn’t. Last week my desk keyboard area that retracts got stuck. There’s a whole lot stuff that got pushed back behind the part of the desk that retracts. When I started pulling stuff out that I could easily get to I found the phone bill that I though never showed up and paid late…sigh, and my Laws book on drawing birds with that lovely Cardinal on it!! I like this book so much better than the other book I bought that teaches how to draw birds. It also teaches color theory. Mine is still in box packed up in the garage and I have needed it several times. I need to get motivated to go through all the boxes I moved out there last year. Boxes! Aaaaargh! I just moved. So I spent a week packing and now I’m in the process of unpacking. Sounds like you have a good reason to unpack at least one of the boxes in your garage ;-). Thanks for the book recommendation. Unfortunately, the public library doesn’t have it. And I try not to buy books because I move way too much. But I’ll look out for it next time I go to the art store. And maybe one of the colour theory books at the library will be full of fascinating info!!! Your Cardinal and Yellow-headed Blackbird are breathtaking. Love the detail and vivid colors. The have such a wonderful depth to them. Thank you for sharing these beautiful drawings. Wowza myriam! The beautiful delicate details. Exquisite art!! Wonderful work! So glad you got the Polys. I recognized the cardinal from the cover of the Laws book immediately! You’re even doing bird feet well! Very impressive! Thanks Laura :-). I kind of like doing bird feet, though they do take me a few tries. Really hard not to make them enormous with oddly shaped toes! Thank you for recommending the Polys. They blend beautifully and there are so many gorgeous colours. So glad you’re enjoying them! They’re wonderful! Your colors really glow! Haha, love the martian eye. Oh boy, I’ve done the same thing. Sometimes you can neutralize it with a little bit of the complimentary color hatched over. Thanks Melissa :-). J was wondering why I didn’t start over after colouring a weird head (it was the first thing I coloured). I guess I have mixed feelings about it. I kind of like its oddity. Plus it is a good reminder to be a little more gentle with my streaking in the future. Oh my gosh, your artwork takes my breath away. Thank you Myriam for sharing your lovely birds. Thanks Teresa 🙂 ! Oh you are much too sweet (thank you, thank you ❤ ❤ ) toward the martian eyeball! Though I do think it is kind of cute in its oddly streaked and slightly oversized way :-D! I like his pose and I think the rest of the drawing turned out well… in a more conventional sort of way. This week, my box of colour pencils has gone from the scary box I avoid to a box of colouring heaven. I like making new friends :-). Really great work! Amazing the amount of detail you worked in here in just one hour. Wow!!! Thanks M :-). I draw more quickly when I’m drawing from another drawing. Someone else has already done the task of abstraction for me!